There are four estates of democracy. These are: The Legislature, Executive, The Judiciary and The Press (now called, Media). The legislature is the people’s representative body, elected by the people. The legislature legislates, lays down the law. The Executive implements the law and provides government services. The Judiciary ensures Executive compliance with the Constitution and laws. The Press is to be a watchdog over the other three. Unfortunately, the Press have become presstitutes, available to the highest bidder. Hence, is the need for a Fifth Estate. Movements, such as the “Arab Spring”, “Occupy Wall Street” are extreme examples of the Fifth Estate take over, sometimes successfully and sometimes not so well, the role of the Fourth Estate. In this website which, is meant to encourage an active role for the Fifth Estate in governance, you will find views and constructive suggestions for action. Visitors may post articles, comments, participate in chats, organize chat sessions, set up and take part in Forums and discussions therein. All this absolutely free. This is a tool for all those interested in how they are governed and how they may make the other estates of democracy accountable to them. You would also find useful information on solution to problems people face due to deficiency in governance and other services. 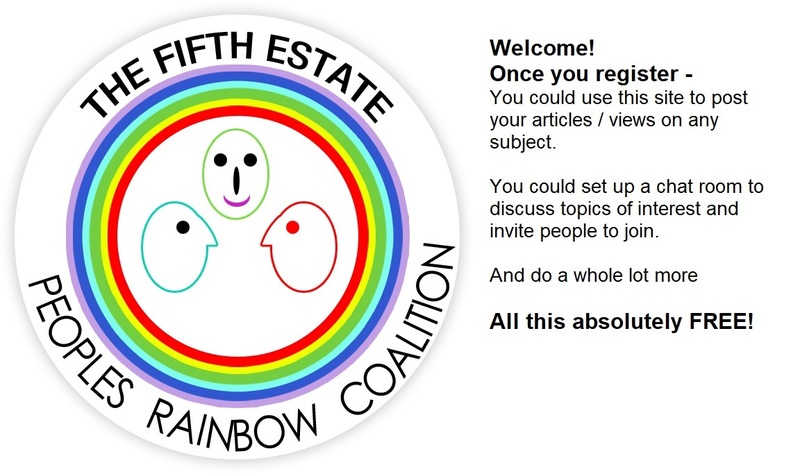 All are invited to join the Fifth Estate to bring into India and other parts of the World, governments that are truly, of, by and for the people. To market your campaigns, services and products on this website please login, click the "services offered" link, under "Useful links" in the right menu and submit for further processing. Please register to post articles / comment / pictures / blogs / start discussions. A Podcast on how to protect your investment while buying a home.